Kuta Karnival is one of the many annual festivals in Bali, which is held in Kuta, Bali, usually held in September or October, and is the most important activity for industrial tourism in Indonesia. Procurement Kuta carnival centered on Kuta beach, and the main attraction for tourists who come to Bali, even the main attraction for people to come to Bali. Filled with a variety of exciting activities. So it is not surprising that in every single show this festival can invite admiration of many immigrants and visitors. Since this annual event colorful and filled with excitement, so as to attract tourists from various countries. 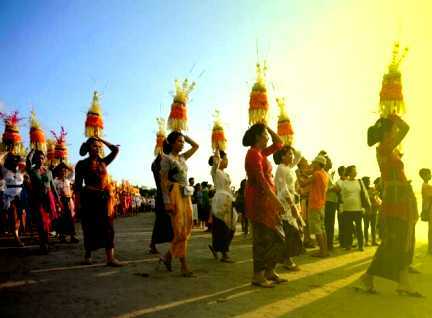 This event is always eagerly anticipated by foreign and domestic tourists visiting Bali, especially in Kuta beach. Kuta Karnival is a routine event that began in 2003, after the Bali bombings, which could dampen the tourism industry in Bali, resulting in fewer foreign tourists to come to Bali. As the interest for the tourists coming to Bali is reduced, the local government had the idea to make the show interesting, but different. Then came the idea to create a performance that a named Kuta Karnival. Kuta Karnival included in international event This event should help attract tourists to come to Bali in September and October. Months before the Bali bombings. The festival is really dynamic and full of color, has a unique charm, because participants were not the only people of Bali and Balinese art, but also a variety of art from abroad come to be part of this festival. In addition to performances of Balinese art, the activities of Kuta Karnival also filled by performances of local bands and international, from a variety of musical tastes, such as Hip Hop, Punk, Pop, Rock, Jazz, Blues and Ethnic along the coast of Kuta and Legian. A parade was also held on the highway, which was followed by the dancers, gamelan, floats, decorated bicycles, scooter clubs and other motor clubs, decorated carts, etc.. This event was also attended by local businesses and Balinese community groups. Also there are various competitions, such as surfing and skateboarding competitions, iron man, rowing race, and the race pool. The visitors were also entertained with live music performances, on stage by the beach, along with a DJ selection, fashion shows, world-class bartender service, cabaret and many others. Kuta Karnival also offers food stalls and children's entertainment arena with entertainment clown, learn how to make crafts, decorate balloons and various other games. Visitors can also taste the exotic Indonesian cuisine in this festival. Times during the Kuta Karnival is a time to enjoy with friends and family. Kuta Karnival is a time to take a break from the daily routine. For foreign tourists, Kuta Karnival is an exciting and entertaining event.